After Chile upset Spain 2-0 today to seal La Furia Roja's flame-out, Chile fans swarmed downtown Santiago to celebrate and make tons of noise, because that's what a country does when it takes out the defending World Cup champions. The best photos are from taller buildings nearby, looking down at the swarm in Plaza Baquedano. 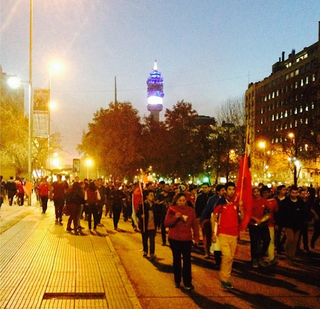 Mashable put together a nice collection of the sea of Chile fans taking the area over.